Week 44: A Person Who Inspires Me. This topic does not have one answer. The world inspires me. Music inspires me. Life inspires me. You’re asking me for a person who inspires me? My boys, Chris and Jim, inspire me. They are strong and have faced many obstacles in their lives. They’ve faced hurts and have known happiness. Somehow, they always find their way. They are strong. Both of them are there for me in my time of need–both positive and negative needs. Both of them tell me how proud they are when I publish a book, or when I have come through the crap life has thrown at me. They’re grown men now and face what life throws at them so they understand. I can only hope to be an inspiration to them, as well. They inspire me. Other authors inspire me and always have from as far back as I can remember. I’d look at a book in my hands while I dwelled on the author’s name. I dreamed… I knew. One day I’d have my name on books like they did–as they do. Maybe one day, at least one person can be inspired by me as an author. My friends inspire me. What would life be like if I didn’t have their shoulders to lean on? Their ear to listen? Their smiles and pats on the back? I’ve lost a BEST friend. I do know what it’s like. Fortunately, I have other friends. Patti and Karen are two friends who inspire me. I dedicated one of my books to them. It’s no surprise that I colored outside of the lines with this post and didn’t stick to a person who inspires me. 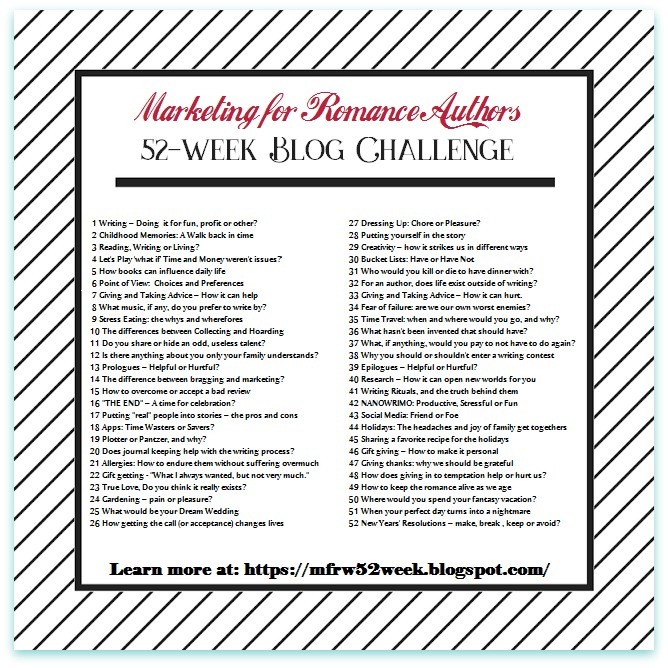 If I thought about it and wanted to write a longer post, I bet I could come up with more, but for now, this will do because y’all have other authors to visit, if you choose to follow me on this Marketing for Romance Writers 52-Week Challenge Blog Hop. 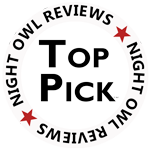 Marketing for Romance Writers (and many other genres) celebrated its eleventh year birthday this week. Its creator is Kayelle Allen. Many volunteers help to keep the organization running smoothly. Kayelle is an inspiration. Have a nice weekend. Thanks for reading. Have you ever made a playlist for 12 months of your life? I came across the idea somewhere and I started compiling ideas. I came up with songs that in one way or another, fit my last year. Please accept the invitation to listen to any of your favorite songs on my list of songs for a year in my life. If you ever made one for yourself I’d love to listen. Farewell 2011. Thanks, but I don’t want a replay.